The demon’s world was a more confined place than Hifumi had expected. With the elven barrier being powerful, there are sometimes openings which can be located. But it seems to be rare to discover those at a level were demons are able to pass through them. Phegor who is working as aide of the king continues to explain while showing fatigue on his face which had taken on an ill-looking, grey skin colour. Phegor looked at Hifumi, who is walking next to him, with a fleeting glance and put his breathing in order. While scratching his skinny cheek with his index finger, Phegor examines Hifumi’s expression. Sighing deeply, Phegor shakes his head. Phegor, who was startled by Hifumi suddenly raising his voice, was also surprised by Hifumi being all smiles. From then on until they arrived at the city of the demons, Hifumi monopolized the conversation. Phegor faced Hifumi, who was unexpectedly enthusiastic, with a question. If that’s the case, won’t fighting with the humans turn into an extremely disadvantageous situation from the very beginning even if the demons break through the elves? Phegor felt uneasy. However, that gets quickly denied. “Though that’s from my experience up until now”, Hifumi muttered while looking bored. The “one region” Hifumi added caught Phegor’s interest, but he isn’t able to interject while Hifumi is talking excitedly. Hifumi didn’t particularly say anything about this cautious approach. Although he believed that Phegor would say a lot more radical things, he decided to accept it for the time being. The city of the demons. The wall visible from a distance has a height of around 4 meters and a complex structure of having been formed by carefully cut stones. “The soldiers patrolling on top and the watchtowers at various places are essential in their stationing for the sake of making sure that no flying monster types are approaching”, he explained. Hifumi nodded only slightly towards Phegor who is talking in a somewhat bragging manner. Greeting the person who appears to be a gatekeeper, they pass through a narrow, gloomy side gate where two people side-by-side barely fit through. The gatekeeper stared at Hifumi in wonder, but he didn’t say anything in particular. There is an additional large gate, but except for the time when many soldiers have to enter or leave all at once, only the gates for people and carriages seem to be used. The faces of the kings of Swordland and Orsongrande, he killed, and of the king of Horant, who was friendly in contrast, rise to the surface of Hifumi’s mind. After looking at Phegor’s face, Hifumi nodded. Zanga wore down her mind for the few minutes it took Hifumi to go through the barrier and collapsed right at the spot when she restored the barrier to its original state. The sound of someone gulping could be heard. “It’s fine for you guys to do as you like as well”, when Zanga said that, the elves threw countless questions at her. As her voice couldn’t be heard through all the noise mingling together, Zanga waved her right hand and they calmed down. Zanga, who got up being held by two people, began to walk while propping herself up with the wand. The elves chased after Zanga, who quickly left walking at a pace one wouldn’t expect of an old woman who had trouble standing up, in a rush. And, at the beginning everyone showed a reaction that they couldn’t believe the story about the last moments of elves which Zanga and Puuse explained to them in the opened meeting of the elves. Zanga, who considered that reaction to be only natural, talked about her experience of having abandoned her grandmother. Next Puuse talked about the elder she met together with Hifumi. And after that several elves timidly talked about the things they ended up seeing of the way their acquaintances and relatives, who broke the law, died. Some among them burst into tears due to fear and regret. Zanga simply laughs due to the as-expected chaotic state. Puuse is anxious and in a state of being unable to stand it. Everyone’s looks gather on Zanga due to her remark. There are some who direct glaring looks at Zanga who makes an irresponsible remark. Alongside a sigh, Zanga turned towards the direction of the demons. As Puuse was unable to comprehend, Zanga gently stroke her head. The figure of a human being led by Phegor caused a commotion among the people of the city, but by limiting it to watching from a distance, there was no one who came to start a conversation with him. The one who came shouting all of a sudden was the giant whom Hifumi had already seen before. It is the man who was mowing down the pack of monsters by brandishing his longsword at the time he watched the city from outside. Beleth laughed scornfully at Phegor who reprimanded him calmly. Corresponding with his huge body, his voice was loud as well, but as Phegor seems to be accustomed to it, he doesn’t show any nervousness either. Due to Phegor stating this bluntly towards Beleth, who is two heads taller than him, without taking a single step backwards, a women approached. Her height is about the same as Hifumi’s? With the long ears identical to elves which make it immediately apparent that she’s a demon, the woman was a beauty who had a pale grey skin. Possessing blue, close to light blue, hair and likewise coloured eyes, she wore a robe with a slit that highlights her rich bust and boots with high heels. Phegor obviously showed a bothered expression, but ignoring him completely, the woman called Vepar looked in Hifumi’s direction. Hifumi, who was looking at the state of the demons’ city while disregarding the conversation between Beleth and Phegor, looked at Vepar’s appearance disinterestedly. Vepar gets directly in front of Hifumi and takes a long hard look at his face. 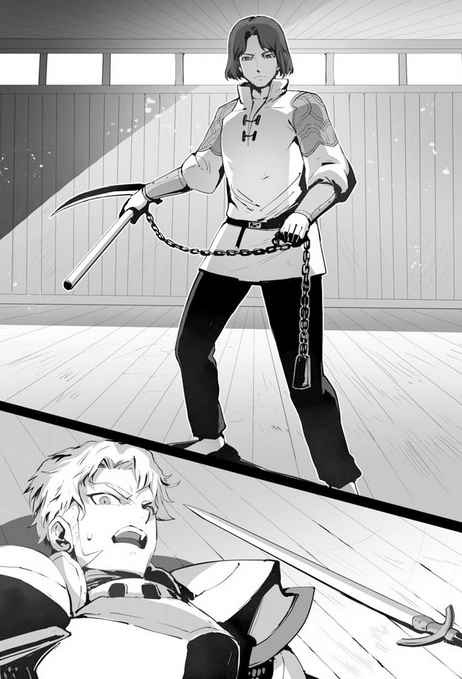 Vepar, who intently gazed at his face with a serious look, quickly lined up next to Hifumi and when she tried to closely embrace his left arm, he escaped. Receiving the look of Hifumi assessing her vigilantly with narrowed eyes, Vepar folded her arms in a pose that her breasts were pushed up and her body trembled. Hifumi looks at Phegor and points at Vepar. Phegor bowed slightly and said 「Sorry」. Due to Vepar trying to snuggle up to Hifumi as soon as there’s a chance, Beleth bellowed while sweating. Beleth, having a finger pointed at him in order to provoke him, blushes and becomes heated up to a degree that it looks like steam is rising up from him. Inclining her head to the side, Vepar directed a sidelong glance at Hifumi. Beleth faced Hifumi with a look full of rage. Vepar stuck out her tongue towards Beleth who walks heavily in the other direction while heaving his shoulders angrily and going bow-legged. Phelgor, who gave her a short warning, called out to Hifumi and they began to walk once again. Behind him Hifumi and Vepar are walking side-by-side. Hifumi only turned his gaze at Vepar who showed an unnatural surprise. A chill travels down on Vepar’s spine. Her body trembled with a shudder, but her mouth smiled. A succubus. Called it. Hell yeah, moist demon holes, here we go! But the first female demon he meets is an M…this can go in multiple directions…. Well,somehow, i dun fully understand the conversation after Vepar join showherself..
Wao, the biggest M girl is here. What will happen if Orga as wife know the bug(Vepar) is invade Hifumi life? It give chills to my spine just think of it. Thanks for the chapter, yep another dangerous female aproach, by the way I am sure that the shiver she felt wasn’t from Hifumi but more from Origa that will kill her if she intends of putting her hands on him. No matter how many waifu you throw at him, Hifumi is married to bloodshed war alread- I meant Origa. Now, let’s see how the Maou is… (I bet he will stay alive, contrary to the previous kings, just for a change). Is it possible to compile all illustrations somewhere so we can consult them? This is in Chapter 71 and below is Vaiya. The guy did ask to practice the usage of kusarigina from Caim and the guy shows him how to used it.